Koodiyattam is an important and ancient dance form of Kerala State , India. It is also called as Kutiyattam. It is officially recognized by UNESCO as a Masterpiece of the Oral and Intangible Heritage of Humanity. Koodiyattam is the oldest among the existing classical theatre forms in world. It is a 2000 year old tradition of enacting Sanskrit dramas through dance. Koodiyatam has its origins in the temples of ancient Kerala where the art was consecrated to appease the Gods. Padma Shree guru Mani Madhava Chakyar mastered Rasa Abhinaya with special reference to Netrābhinaya. He has been a major force in popularizing Koodiyattam by taking it out of the Hindu temples, performing across India with his troupe, and teaching it to non-Chakyar caste members. Koodiyattam origin and evolution are shrouded in mystery. 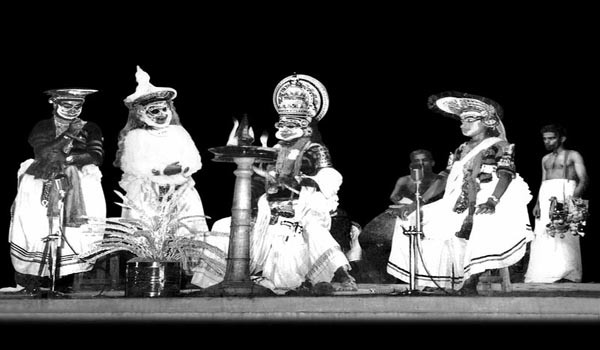 Kutiyattam and chakyar koothu were among the dramatized dance worship services in temples of ancient India, particularly Tamilakam (modern-day Tamil Nadu and Kerala). Both kootiyattam and chakyar koothu find several mentions in ancient sangam literature of south and also in the epigraphs belonging to subsequent Pallava, Chera, Chola periods in Tamil Nadu. There is evidence of these services being done all over ancient subcontinent during time of cholas and pallavas.It is believed that Kulasekhara Varman Cheraman Perumal, an ancient king of Tamil Chera dynasty, who ruled from Mahodayapuram , reformed Koodiyattam, introducing the local language for Vidusaka and structuring presentation of the play to well-defined units. Koodiyattam Traditionally, the main musical instruments used in Koodiyattam are mizhavu, kuzhitalam, etakka, kurumkuzhal, and sankhu. Mizhavu, the most prominent of these, is a percussion instrument that is played by a person of the Ambalavas Nambiar caste, accompanied by Nangyaramma playing the kuzhithalam .Soorpanakhangam Koodiyattam and Jatayuvadham Koodiyattam are two popular Koodiyattams performed. Koodiyattam is based on a highly developed mime language. Great emphasis is laid on facial and eye expressions, and hasta mudras. Elaborate costumes and extensive use of colors heightens the spectacular effect.